A man who ran over an armed policeman said he believed the officer was a gunman and "feared for his family's life", a court heard. Yasin Adam's car hit the Leicestershire police constable outside the defendant's home in Bradbourne Road, Leicester, in October. The 25-year-old told Leicester Crown Court he panicked and tried to drive away when he saw a man pointing a gun. He denies attempted murder and grievous bodily harm. He also denies causing serious injury by dangerous driving. PC Thomas Hamilton-Rutter suffered injuries including a fractured skull, hearing loss and bruising. The court heard on Thursday Mr Adam had been followed by two marked police vehicles in the early hours of 5 October. 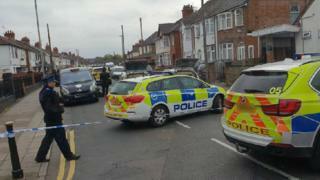 It is alleged two armed officers approached to stop the car but Adam reversed into the road and into Mr Hamilton-Rutter. The jury was played dashcam footage showing Mr Hamilton-Rutter carried along by Mr Adam's vehicle and saw how he was subsequently left lying on the ground as the car drove off. Giving evidence in his defence, Mr Adam said when he arrived at his house he realised he needed to get milk so he reversed on to the road then saw a figure dressed in black pointing a gun at him. "It was like I saw my life flash before me," he said. "I was really scared. I feared for my family's life." He said he did not know the man was a police officer and hit him as he accelerated away in panic.